As an Indie Author, sometimes it seems like everything is working against you, but other times...other times it seems like the planets are aligned in your favor. Like this morning, I woke up, set up my liquids for the morning, and voila! Double Darth! When I was still teaching, I had a reputation for being a pretty tough (but fair) professor, and some of my students started joking that I was like Darth Vader to my department chair's Emperor Palpatine. As I got sicker and sicker, the University went to great lengths to make my work life bearable, including outfitting my office with special chairs and a powered work/stand desk. I could press a button and the desk would move to a pre-programmed position. Once my department chair saw that in motion, he immediately dubbed it Vader's Meditation Chamber (from the original movies, the dome-like thing that Vader sat in with his helmet off). From there, it just stuck... I started getting anonymous Darth Vader themed gifts--a Pez dispenser, an M&M dispenser, and HUGE Vader head for my desk, etc. After my disease had progressed to the point I could no longer be productive at work, I went on disability, but the gifts kept on coming. One of them was a Vader Tervis cup and it became my habit to eschew all other cups if old Darth was available. Of course, that is something Real-Sig™ would notice. 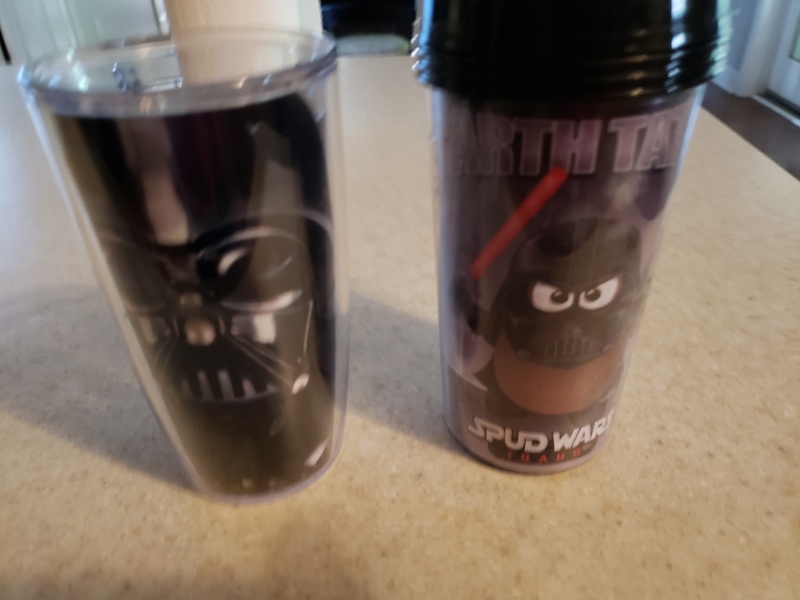 On our recent trip to Idaho, he found an insulated Spud Wars coffee cup that has "Darth Tater" on the front and surprised me with it. Today is officially Double Darth Day here at Chez Monster™, so those dratted rebels (and my Personal Monster™) better look out!